The combination of Ox and Cancer gives birth to a unique personality, woven from contradictions. People of this combination of signs do not differ in decisive character, are slow, calm. They try not to attract attention to themselves, prefer to observe the events taking place, and not to take active actions. In addition, they are more interested in inner feelings than real life. They are dreamers and contemplatives, but they are not harmless creatures. Cancer-Oxen, if necessary, are quite assertive, know how to achieve their goals. They have strong intuition, soberly assess their capabilities, are diligent and considerate. Therefore, their future can not be worried: Oxen-Cancers can successfully arrange their lives. Calm Cancer-Ox does not see any sense in fighting and overcoming obstacles. Will not get involved in the thick of events, will try to wait for a favorable moment. He is not too confident in himself, he carefully thinks through every step not to be mistaken. Doubts, experiences make him a closed person, completely immersed in his thoughts. It is fickle and distrustful, too dependent on the opinions of surrounding people, so that it adequately refers to criticism. He painfully perceives remarks, therefore he tries to surround himself with people who are endlessly trusted. In general, Ox-Cancer is a shrewd and judicious person who listens to intuition. However, in an outburst of emotion, it often makes the wrong decisions. Softness, defenselessness of Cancer-Ox should not be misleading. Although he is actually a sensitive person, but not so meek and vulnerable. It is quite capable to defend the opinion if on that there will be serious reasons. Does not differ in fighting character, but also will not allow to mock at itself. This is a very kind, affectionate person, ready to help everyone. Therefore, he can not accept betrayal. Sincerely does not understand what can move people, causing others pain and suffering. Although he himself sometimes transcends the bounds of what is permissible, he is despotic, capricious and demanding. He considers himself entitled to control close people, but this is from great love and desire to protect them from problems. Like all Cancers, people of this combination of signs are very attached to their family. This is not revelers, adoring cheerful companies, on the contrary, spend all their free time at home. Although quite friendly with everyone, they willingly take part in festive feasts. But do not seek entertainment, do not feel the need for vivid emotions. Cancer-Oxen are not inclined to gambling, do not like active rest. It is hard to get used to everything new, afraid to dramatically change their lives. Often missed opportunities, too long gather with thoughts and ponder their actions. Cancer-Oxen — homebodies, love peace and quiet, are not afraid of loneliness. With great pleasure, they remain alone with themselves and fantasize about various topics. Tactful, polite Cancer-Ox acts gently and unobtrusively. He tries to win love not by extravagant deeds, but by caress and care. It will be long and tasteful, gradually revealing its dignity. Seriously refers to the relationship, so the choice of the second half is very responsibly. Very wounded, shy, but a strong feeling can propel him to heroic deeds. Will do everything possible and even impossible, but will achieve reciprocity. It is difficult to find a person more devoted to his family than the Cancer-Ox. Completely focused on close people, little interest in what is happening around. First of all, he is worried about the family, and the rest will wait. Distinguished by a benevolent disposition, always open to talk with children. He loves his house, loves him with his clothes. Ox-Cancer needs a personal space, sometimes it needs to be alone. If close people do not understand this, they will face a serious scandal. These people are too passive and focused on their own feelings to actively participate in the life of society. Of course, they are not alien to the joy of life. They have good taste, like to buy expensive things. Therefore, the size of the salary is of great importance, but not to such an extent as to exhaust yourself with work. Bullfinches are hardworking, responsible and observant. Good psychologists and teachers can turn out from them. Have an amazing ability to have children with you. For normal life, Cancer-Ox needs stability, he does not need to change his impressions at all. Therefore, he chooses a job that is not related to moving. With great desire will perform the most tedious errands, if only not to take responsibility for themselves. Do not dream about the position of leader, do not hesitate of any work. Always accurate and collected, even if there is trouble, will not show his grief. Calmly continue to work at the usual pace, this is the perfect performer. Cancer man, born in the year of the Ox, has enough faith in his strength to boldly go through life. Sentimentality, vulnerability recede into the background, but intuition, characteristic of representatives of the water sign, remains with him. Therefore, rather accurately determines the right direction, to its goal moves slowly, but stubbornly. He prefers to act deliberately, avoids risk, strives for a calm, comfortable life. In relations with women, he manifests himself as a tactful, polite partner, taking into account the interests of the other half. Sharply needs care, attention, this tender, gentle husband, a loving father, a family for him - the meaning of all life. But deceit and disrespect are capable of awakening negative emotions in him, the Ox’s fury can manifest at any moment. The combination of Cancer and Ox gives birth to a unique personality, the woman of this combination of signs is a contradictory nature. It seems like a fragile person, but inside it is a steel rod. A strong enough, pragmatic woman, Cancer-Ox knows what she wants and how to get it. Success is achieved not by hard work, but by the ability to happily use your chance. Material values ​​are important, but still pay more attention to their spiritual development. In a love relationship seeking peace, the partner must be reliable, even predictable. Does not feel craving for adventure, does not need changes. 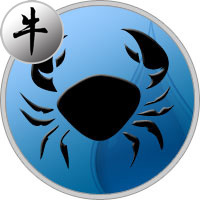 Cancer-Ox is a reasonable woman, she will not start quarreling and conflicts, but she will not tolerate a rude attitude, she will find a way to resolve the situation peacefully.